The city of Minneapolis will be opening up their doors to the public during the weekend of May 18-19. A chance to check out buildings in the City of Minneapolis that are architecturally, culturally, or socially significant. The Doors Open event is free and gives everyone the rare opportunity to see areas and buildings we might not normally see. The list is long and fascinating. I want to visit ALL of them and hope this event can be an annual thing or maybe even twice a year. There are so many great places to visit and just not sure a weekend is long enough to try to fit them all in. We are sharing this early so you plan accordingly. It’s probably a good idea to make a list of your top places and make sure to visit those first in case they don’t do this again. 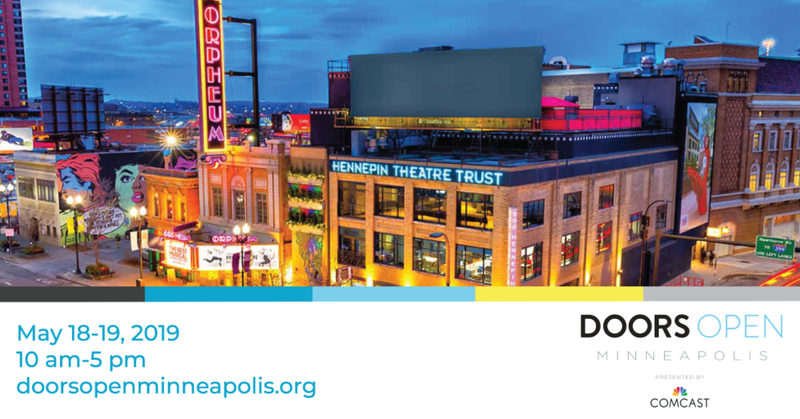 Doors Open Minneapolis is your chance to explore the buildings that tell our city’s story. From theaters to business hubs, sacred spaces to private clubs, sports complexes to engineering wonders, historical gems to not-even-open-yet buildings, Doors Open Minneapolis will give visitors a FREE behind-the-scenes look at over 100 exciting venues. We’re hoping to enrich experiences by presenting meaningful conversations with many of the people who make these venues the marvels that they are.